Just about every year I buy 1 of these to last me thought out the year. The only reason why I go through them a bit faster is b/c where I had it installed under my canopy. The only reason why I replace them ones a yr is b/c mine would rusts due to the saltwater and were I had it placed in my canopy. I am getting ready to but 2 more of these to hide inside of my new tank build. They are built strong and very durable. Did not effect my evaporation that bad either. I tried to avoid buying a cheap clip on fan that would break quickly or not perform well. This is exactly what I got with this "higher end" fan. In 8 months this fan hardly moves air. There is no warranty or costumer service to replace this item. Save your money, but something else. These are the only kind of fans I will buy is the AIR KING! I buy one just about every other year to run across the top of the water on my 120. It brings down the temp about 3 degrees and then i have one blowing in my sump. I have tired just about every fan on the market and i keep coming back to the AIR KING... They are build pretty solid and you should be able to get a min of 2 years out of them if not longer. These fans are the best bang for your buck in my opinion! HIGHLY recommended if you're looking to cool your tank down a few degrees. i bought one of these fans a year ago. I control it with an Apex. It will knock the temp down at least 3 degrees. I noticed the chrome grill is rusting so I probably will not be using it much longer. Very strong and silent, it's pulling the temp down about 1 1/2 degrees more than another fan I have purchased a w mart. The only drawback is the clamp is alittle weak otherwise it's a great fan and I would recommend to anyone. 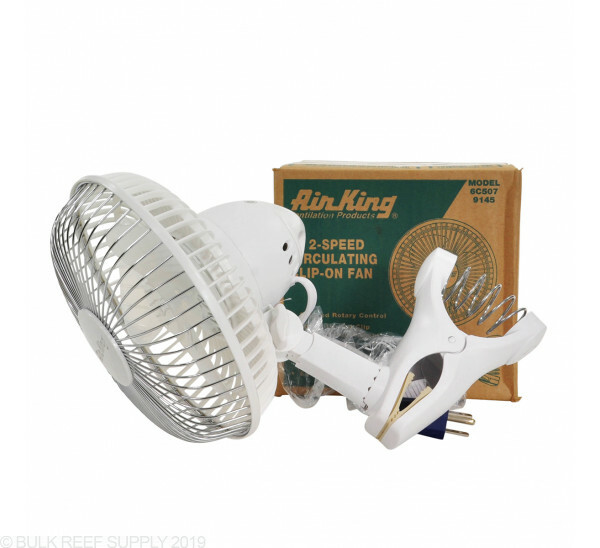 This is a desk fan that is not rated to be anywhere near saltwater. After 3 months of continuous use, the fan grill and motor has rusted up on 3 of these. All three randomly trip the GFCI if plugged in. Not worth the stress of power-outages/electrocution. I purchased two of these fans. I have a 120 peninsula design and have one blowing across the top water surface, and one being used as an exhaust fan out of the top of my cabinetry Lowered temperature by nearly 3 degrees. My chiller has yet to turn on since installing nearly a month ago. Very quiet...I can't hear them running. Very happy with these fans. Nice and Quite and Great price. Think I'll buy another. very nice fan. it lowers water temp pretty quickly and is very quiet you can even hear this thing running. i will probably purchase another one. highly recommended. I've had mine for all of 3 days. Every time my temp hits 79.1, this kicks on and the temp starts dropping. It does exactly what its supposed to do. I live in an apartment with no central air. Granted I live in SoCal, but on occasion it has hit mid 90's. I will do a follow up this summer when temps hit 100+. I've used these fans on a couple of my setups. There a lot quieter and push a good bit of air for their size.